The complete season 3 of Game Of Thrones on Blu Ray. You'll love Game Of Thrones season 3 Blu Ray from DVDLand. Like the other seasons, the third consists of ten episodes. It is based roughly on the first half of A Storm of Swords, the third of the A Song of Ice and Fire novels by George R. R. Martin, of which the series is an adaptation. 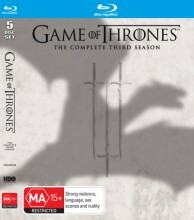 Click the button below to add the GAME OF THRONES - COMPLETE SEASON 3 (BLU RAY) to your wish list.